Maybe we’re not living with a sense of empowering energy? This entry was posted in Encouragement, Motivation and tagged Awareness, Courage, Encouragement, Inspiration, Life, Motivation, Wisdom. Bookmark the permalink. My heart’s desire–empowering others to build connections for peace and goodwill, for the benefit of all Creation! granbee, wonderful quote! and wonderful use of the hammer! love this. I think I shall carry one of those hammers with the big rubber head though – still gets the job done and better suits my personality. I really needed to hear this tonight. Blessings my friend. oh that is so beautiful and so blessed me. I listened to it a few times and shared it on FB. How did I not know you have these wonderful YouTube vids? silly me. Isn’t that kind of…ummm….surprising?…a whole “youtube channel” of my very own…sometimes I pop over there and just kind of look at it in surprise and think… “how did I ever manage to do this? ?”…you just never know! creativity moves through us and into the world to bless and nurture others – sometimes even taking us by surprise as it does! I love that we live at a time when it can be shared with others. Hmmm. Interesting to think about this one. 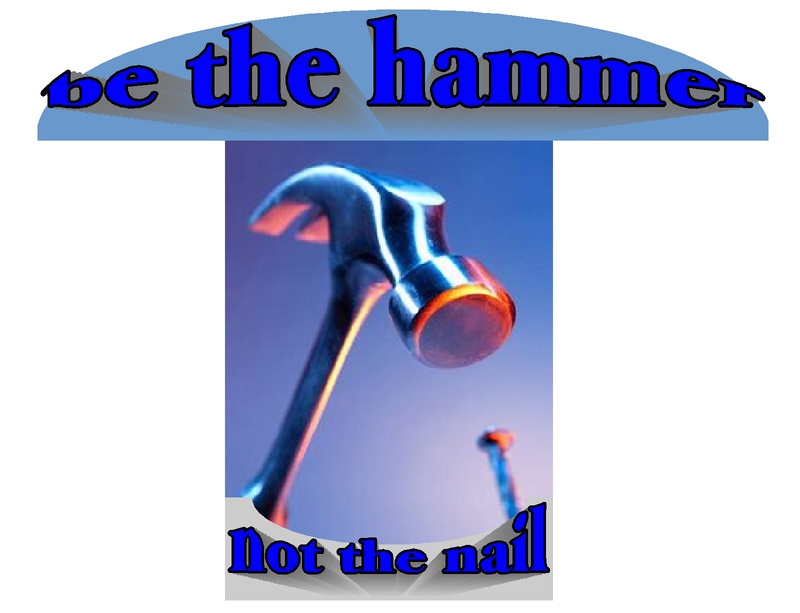 Intuiting when it’s time to be the hammer and when it’s time to be the nail — well, that’s the difficult part of this. Nice post! 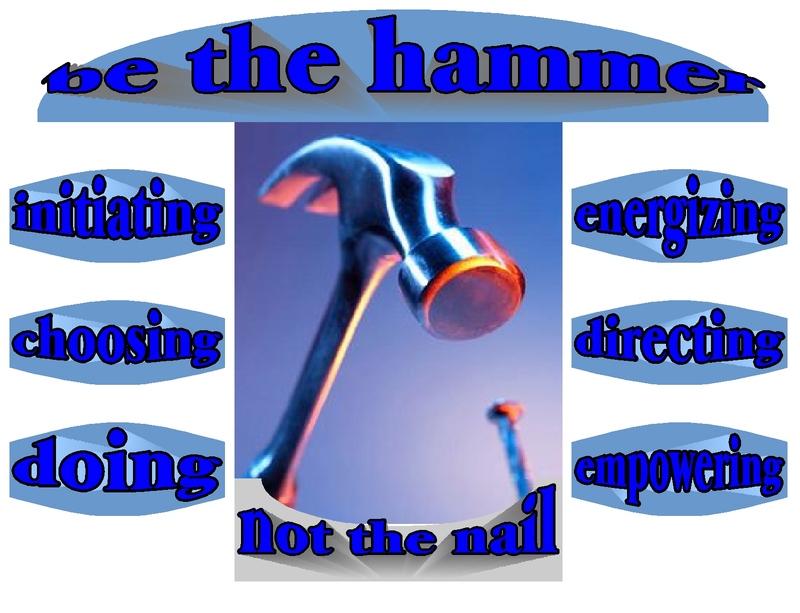 yes….discerning when to be in the role of the hammer and when to be the nail… I noticed this afternoon that in order to be more of a hammer, I needed to get myself going with stronger intention, motivation and carry through…I taped that hammer image up on the cupboard door and actually managed to make more helpful choices. The thought of being the agent in charge had never occurred to her. I’m just the opposite, I never wait for THEM to do something when I can improve my situation myself. I think your mom and I need to sign up for Nancy101 …oh, your mom doesn’t realize it, but I guess she’s already enrolled…..sounds like we both could use that “agent in charge” training…. 😉 …but, seriously, I could use that! Just ask, “what can I do to make this situation more bearable?” Then do it (as long as it doesn’t step on anyone else’s toes). Many stop themselves from improving their present situation out of self-consciousness. They are more concerned with what others think of them (in their own imagination), then they are in improving their physical well-being. For example, if I’m in the middle of a BORING seminar when my attendance is NOT required, and I know that I have better things to do . . . I LEAVE. I don’t care what reasons THEY assign to my departure . . . I just go. It’s very liberating. Very thought-provoking. It’s hard to know when to be the hammer and when to be the nail. I don’t think I’m the hammer very often because I’m relatively easy going, but when I do decide it’s Hammer Time, well, people know it. lol! That was a great pleasure to read various posts here, as well as a fantastic opportunity to get a new knowledge. There is no doubt, your blog is the most exciting and breath-taking one I have visited for the past weeks.